PART# 219400077. ULTRASPORT WINDSHIELD. Spyder RS - 2015 & prior. NEW CAN-AM SPYDER OEM. 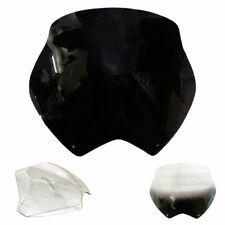 Makrolon polycarbonate windshield with blackened-out "V" shape profile. New OEM Spyder Rear Fender OEM Part Number: 219400400 (QTY 1) Item only fits specific models listed. The picture could be generic. Message us with VIN/HULL for fast fitment verification. Fits: Spyder RS, ST 2014 and prior. Removed From: 2013 Can-Am Spyder RS. This windshield is in very good condition and shows normal signs of wear. We are a cycle/atv salvage yard located in central PA. We try our best to inspect each part to ensure that when you get it, it bolts up and functions as it should. Spyder RS 2013 and prior. Side deflectors are not included in the Ultra Touring Windshield kit. Ultra protective windshield and casting supports. Windshield design is spaced away from pod reducing backdraft pressure. Windshield and integrated side deflector system provides maximum upper and lower screening protection. Size ideal for drivers 5'10" (1.75 m) tall and under. ● Tinted Shorty made from 3mm thick (1/8") dark tinted plastic. Can Am Spyder RS. New Custom Made Shield for your Spyder. Also available for RT, F3, ST, for Limited models too. Color: Tinted. Custom made Windshield . Can Am Spyder RS. New Custom Made Shield for your Spyder. Also available for RT, F3, ST, for Limited models too. Custom made Windshield . ● Includes storage cover, micro-fiber cleaning towel, and mini-spray bottle of windshield cleaner. 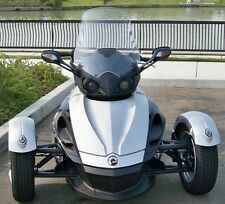 Fits for Can Am Spyder RS. 1 Pcs Windshield. -Quantity: 1 Windshield Only. -Color: Clear and Smkoe. The images are for reference only. -Surface Finish: As Picture Shows. Hardware and instructions are not included. 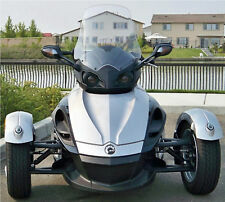 Fits for Can Am Spyder RS. Quantity: 1 Windshield Only. 1 Pcs Windshield. Color: Clear and Smkoe. The images are for reference only. Hardware and instructions are not included. Surface Finish: As Picture Shows. Universal Motorcycle Risen Adjustable Windscreen Windshield Spoiler Air Deflector For Honda BMW Yamaha Kawasaki Suzuki. Universal Adjustable Screen Windscreen Windshield Spoiler Air Deflector. Adjustable windshield, fixed on the above of original windshield suitable for nearly any bike with a windscreen. Laws concerning this product vary from state/province to state/province. All trademarks remain property of their respective holders, and are used only to directly describe the products being provided. Universal Adjustable Screen Windscreen Windshield Spoiler Air Deflector. Adjustable windshield, fixed on the above of original windshield suitable for nearly any bike with a windscreen. 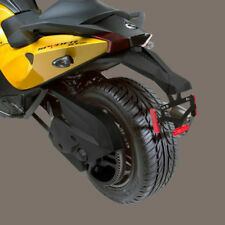 Universal motorcycle can adjust the clip windshield to extend the spoiler windshield. Universal Adjustable Screen Windscreen Windshield Spoiler Air Deflector. Professional modified Acrylic clear windshield provides good-looking while adding an excellent degree of wind protection. Adjustable windshield, fixed on the above of original windshield suitable for nearly any bike with a windscreen. 1 x Windshield with accesories. Fit for Motorcycle,Electric cars. Solve any problems with you in friendly way after communication. due to strict custom inspection. United Kingdom 0% 20% 60% 15%. C ontact us. Airflow Adjustable Windscreen Wind Deflector Universal Motorcycle Windshield for Kawasaki BMW Ducati honda KTM. Adjustable motorcycle windshield, fixed on the top of original windshield. We will reply you within 24- 48 hours. 1 x Windshield with accesories. Fit for Motorcycle,Electric cars. You should receive item within 3-5 weeks. 1 x Windshield with accesories. Fit for Motorcycle,Electric cars. We would highly appreciate the chance to follow up with you if needed. Airflow Adjustable Windscreen Wind Deflector Universal Motorcycle Windshield for Kawasaki BMW Ducati honda KTM. Easy assembly and disassembly. Color maybe a little different due to monitor display. We will reply you within 24- 48 hours. Airflow Adjustable Windscreen Wind Deflector Universal Motorcycle Windshield for Kawasaki BMW Ducati honda KTM. Adjustable motorcycle windshield, fixed on the top of original windshield. 2 Pcs Black 12V Loud Car Truck 510Hz 110DB Snail Electric Air Horn Universal. These 5mm (M5) universal rubber well nuts fit most windscreens, body, & other motorcycle and ATV applications. 10mm length 14mm. Material: High Quality Rubber with Captive Brass Nut. For many Aprilia, MV Agusta, Triumph, Ducati, BMW, Honda, Kawasaki, Suzuki, Yamaha, Polaris, and other Motorcycle & ATV models. Thread: M5x0.8mm. These are used on many motorcycles & ATV's to fasten plastic fairings, body parts, fenders, and bumpers. These 5mm (M5) universal rubber well nuts fit most windscreens, body, & other motorcycle and ATV applications. Well nut to accept M5 x 0.8mm bolt inside diameter 5mm outside diameter aprx. 10mm length 14mm. Perfect for replacing your missing and damaged well nuts. These 5mm (M5) universal rubber well nuts fit most windscreens, body, & other motorcycle and ATV applications. 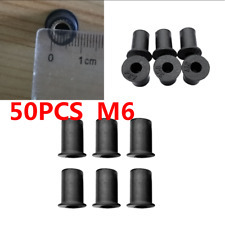 Specification: Condition: 100% Brand New, Never Mounted Material: High Quality Rubber with Captive Brass Nut Color: Black Thread: M5x0.8mm Head Diameter: 13mm or 0.51 (1/2) inch Overall Length: 14mm or 0.55 (35/64) inch Shank Length: 13mm or 0.51 (1/2) inch Shank Diameter: 9.5mm or 0.37 (3/8) inch Head Thickness: 1.0mm or 0.50 (1/2) inch Package Includes: 1x Pack Rubber Nut (50 pcs) Please ensure the fastener is the correct size you require. Airflow Adjustable Windscreen Wind Deflector Universal Motorcycle Windshield for Kawasaki BMW Ducati honda KTM Description： 1. Adjustable motorcycle windshield, fixed on the top of original windshield, heightening for better head protection for riders. 2. Anodized Surface prevents corrosion with stainless steel screws for a long life. 3. Easy assembly and disassembly 4. Color maybe a little different due to monitor display. 5. Fit to all kinds of models. Dimensions: 270mm * 122mm * 40mm Package：as the picture shows. 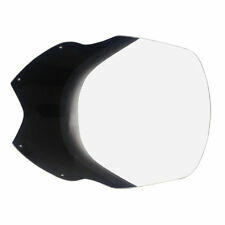 Custom Motorcycle Wind Deflector Handle Mirror Thread Hand Guard Protectors. 2 x Motorcycle Hand Guard. Can fit most of motorcycle with extended mounting brackets. Protection for your hands while traveling on your motorcycle. 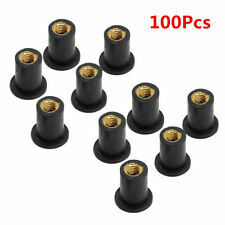 50Pcs M5x0.8mm Rubber Well Nut Brass For Motorcycles ATV Windscreens Fairings. Thread: M5x0.8mm. Material: High Quality Rubber with Captive Brass Nut. 10mm length 14mm. For many Aprilia, MV Agusta, Triumph, Ducati, BMW, Honda, Kawasaki, Suzuki, Yamaha, Polaris, and other Motorcycle & ATV models. 10mm length 14mm. These 6mm (M6) universal rubber well nuts fit most windscreens, body, & other motorcycle and ATV applications. Thread: M6. Material: High Quality Rubber with Captive Brass Nut. For many Aprilia, MV Agusta, Triumph, Ducati, BMW, Honda, Kawasaki, Suzuki, Yamaha, Polaris, and other Motorcycle & ATV models. 10mm length 14mm. These 6mm (M6) universal rubber well nuts fit most windscreens, body, & other motorcycle and ATV applications. Thread: M6. Material: High Quality Rubber with Captive Brass Nut. These are used on many motorcycles & ATV's to fasten plastic fairings, body parts, fenders, and bumpers. High Quality Billet Aluminum Spike Bolts. Easy installation! Simply replace the existing bolts with these. High Quality Billet Aluminum Spike Bolts. Easy installation! Simply replace the existing bolts with these. Material: High Quality Billet Aluminum.